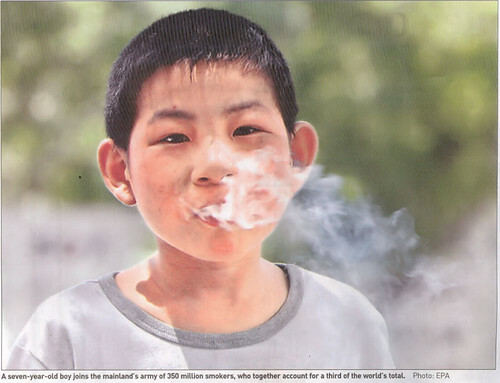 This picture was taken off the pages of the South China Morning Post dated 21 Jun 2006. I cannot help but feel the mighty power of the message that this one single photograph carries. I'll leave you to figure this one out. excellent...so BAT and all the big tobacco firms have switched their focus to China and the other developing countries.... sigh. Oh no, he is really smoking or just an effect!?!?!? Pam: Not really, the tobacco industry here is still very much in control by the gahmen-owned enterprises. Foreign tobacco companies have yet to be able to crack open the domestic market to have a share of this lucrative pie. sunflower: The photo is unfortunately real. second hand smokers die faster than smokers. wow, thats really young... btw, is there anything good in zhongshan? Our local cigarette box should have this photo on it instead of the gruesome photos now. It might help those with children to quit. Spinnee: Welcome to the blog! As for the fact that second hand smoker die faster than smokers, it is a sad and ironic truth. I'll smoke to that! Oh wait... cannot. Quit liao. heather: Gosh is right. Man, I cannot tell you how powerful this photo hits me when I opened the papers that morning. ris: ZhongShan? Well, it depends on what you are really looking for. Care to elaborate? Ed, Edd & Eddy: Dunno leh. The kid in the picture looked so blissfully happy leh. Sekali, people interpret wrongly then how? p.s. How come you no more predicting the world cup liao har? im going to hong kong to meet my relatives, then travel by bus/car to zhongshan for a few days. is there anything interesting to do/eat there? i heard that the scenery is pretty good, is that true? Pa: I also good girl.. quit! Or rather, cutting down.. ahhaa.. But, this is way too young to start and smoke on the street lah. If I rem correctly, I tried when I was like 10yrs old? And not in the public lor! Siao! ris: My ex ex bf is working in zhongshan. he told me its a very industrial place. Lotsa factories and stuff. But of cos got shopping mall and restaurants. I think.. Nothing great lor..
maybe that explains why china got a lot of smoker! Jaslyn & ris: Thanks for helping out with the ZhongShan info. As I am on the opposite side of the Pearl River Delta from ZhongShan, my knowledge across the bank is pretty limited. BTW, when are you heading up to HK? I may be in HK next week. sunflower: You bet there are a lot of smokers here. The business is super lucrative. I can't see the gahmen or any other gahmen willing to give up this source of revenue by placing an outright ban on it. ris: I think that would be a good idea to allocate more time to HK then ZS. Hmm..end Sep - Oct, hairy crab season! Jaslyn: Let me know your date and I see what I can come up with. July is when I start traveling again. However, our schedules fit.